4md Medical Solutions, online at 4mdmedical.com, is a national distributor of medical supplies for consumers, hospitals, clinics, doctors, laboratories, surgical centers, and healthcare facilities. 4md Medical Solutions offers brand name medical products from Johnson & Johnson, Safetec, Kimberly-Clark, McKesson, UMF, Medline, and many more. 4md Medical offers medical equipment and carts, AED defibrillators, canes, crutches, power chairs, walkers, mobility equipment, living aids, physical therapy products, first aid, laboratory equipment, and more. Check out RetailSteal.com for the latest 4md Medical Solutions discounts, 4md Medical Solutions promo codes, and 4md Medical Solutions coupon codes. 4md Medical Solutions offers shipping promos that change often. 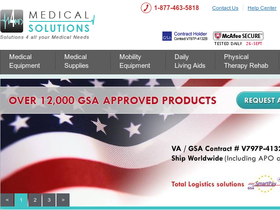 Stop by RetailSteal.com for the latest 4md Medical Solutions shipping special offers. Save 8% on your purchase at 4md Medical Solutions. Use coupon code on purchases $79.99+. Save $15 at 4md Medical Solutions. Use coupon code with purchases $200+. Shop at 4md Medical Solutions and use coupon code to save 5% on your purchase $50+. Enjoy a $10 discount at 4md Medical Solutions. Use coupon code on purchases $100+. Shop at 4md Medical Solutions and get free shipping to the continental United States on purchases $250+. Shop at 4md Medical Solutions and save 8-39% on medical special items. Click to shop. Shop at 4md Medical Solutions and save 20% on wheelchairs. Click to shop. Shop at 4md Medical Solutions for medical supplies as low as $4.68. Click to shop. Save 11% on your 4md Medical Solutions purchase when you enter this promo code at checkout! Offer valid on orders of $100 or more.